Dissident guerrillas patrol the jungle along the Inirida River in Guaviare Department, Colombia, on September 26, 2017. The political events of last week in Colombia made clear that while the country has a real chance for peace, the road is still riddled with difficulties. On the one hand, the unprecedented ceasefire agreement between the Ejército de Liberación Nacional (ELN) and the government of Colombia is an encouraging sign that the peace process with this armed group is moving forward, albeit slowly. The UN Verification Mission in Colombia—tasked by the Security Council in July with the verification of the commitments on the reincorporation of the ex-members of the former armed group, the Fuerzas Armadas Revolucionarias de Colombia—Ejército del Pueblo, FARC–EP (FARC), as well as protection and security guarantees for communities in the areas most affected by the conflict—had its mandated expanded on October 5 to also monitor the bilateral ceasefire with the ELN; a demonstration that the international community continues to be an important supporter of the peacebuilding efforts. The optimism was hampered, however, by the killing that same day of at least six peasants (although some accounts speak of up to 15) during a protest of coca growers in the town of Tumaco at the hands of the police, as the Office of the Ombudsman confirmed. This exemplifies the enormous hurdles facing the implementation of the peace agreement, signed almost a year ago. The first problem facing the process is the strong political polarization and the weak popular support for its implementation: on October 2, the first anniversary of the plebiscite, leaders of the “No” campaign congregated to protest what they see as the government’s disregard of the public’s will expressed in the polls. A languid implementation of the accord, which seems to stem from bureaucratic obstacles, the absence of efficient institutions, and lack of political will, reflects a country that is yet to be convinced that what was negotiated in Havana was not a series of concessions to the FARC, but rather a bet for a peaceful future for all Colombians. The limited implementation that has taken place is mostly related to the FARC’s disarmament as outlined in point 3 of the accord. The completion of the UN-led disarmament process on August 15 marked the transformation of the FARC from an armed group to a political movement. However, there isn’t yet a strategic plan to reincorporate the guerrilla members, who are still mostly assembled in the 26 encampments where the disarmament took place. The FARC has insisted on a collective reincorporation, which is pivotal for the group’s cohesion and survival in the short-term, rather than the individual reintegration that has traditionally been used in Colombia. The situation in some of the zones has become so dire that FARC members were forced to negotiate with the army to guarantee the continuation of food deliveries, which had stopped after the disarmament process ended. This uncertainty has contributed to an increasing number of FARC ex-combatants leaving the zones. The reasons for these departures vary: some ex-combatants are taking time to visit their families, others have simply deserted the group, and—more worrisome—some have become dissidents who have reorganized a military front, or have joined criminal organizations. 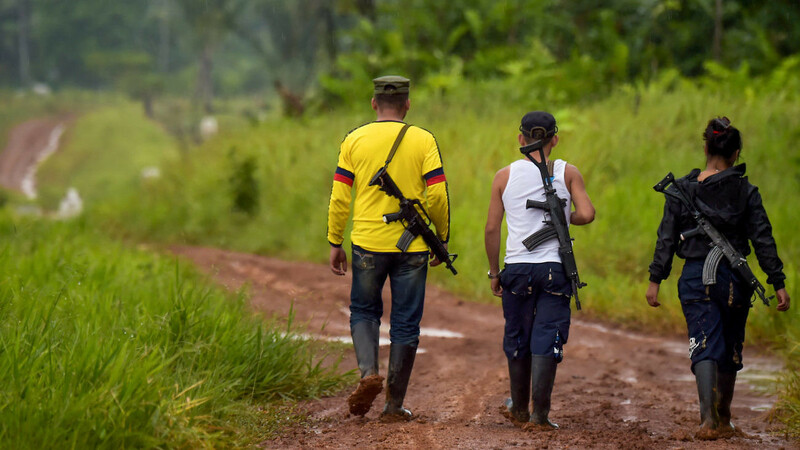 While the numbers of FARC members who have left the zones for each of these reasons remains unclear, a continued delayed in reincorporation programs in the zones will only increase the number of FARC members leaving. The attempts of implementation of point 4 of the agreement on illicit crops has resulted in increased confrontations between public forces and coca growers, as the line between voluntary and involuntary eradication has been blurred. Moreover, a lack of judicial protection for growers willing to submit themselves to voluntary eradication programs and a lack of alternative economic opportunities has stalled progress on this issue. This point of the agreement does not have international verification, which is problematic as evidenced by some of the abuses experienced by coca growers in the territories and the terrible events in Tumaco. Implementation is likely to become ever more complex as US drug policy towards Colombia hardens, making demands on the Colombian government that are at odds with what was agreed in Havana. Meanwhile, progress on the other four points is moving slowly, if at all. Short of two months before the end of the “fast track”—a procedure designed to accelerate the passing in Congress of the constitutional reforms and laws needed for the implementation of the agreement—less than 20% of the needed reforms have passed. Congress is currently debating two important laws: the political reform; and the creation of the Special Jurisdiction for Peace, the instrument for transitional justice. Unfortunately, the beginning of the electoral campaigns has interfered with a speedy approval. As President Juan Manual Santos becomes a lame-duck president, he has been unable to mobilize his weakening coalition in Congress, and the law has been amended during the debate in what many argue breaks from the spirit of what was negotiated in Havana. Come 2018, Colombia will be in full election-mode and little is expected from Congress, which makes the next two months critical for establishing the normative framework of the agreement. The first point of the agreement addresses the needs for integral rural reform, an issue that is very much at the core of the structural causes of violence in Colombia. However, this point has barely been discussed, let alone implemented. Laws addressing the National Agricultural Innovation and Land Improvement System were introduced to Congress in March 2017, and have yet to be debated. This is particularly problematic as this point is closely tied to reincorporation efforts and programs that would give FARC members the opportunity to design and implement rural income-generating projects for subsistence. These projects, which will need to be geared towards a largely and mostly peasant FARC population, will be contingent on access to land and the short, medium, and long-term land tenure guarantees that have long been absent in Colombia. Who is responsible for the delays in implementation is debatable, and the blame-game has been used by both sides for political gain. An overly complicated and extended bureaucracy has led to competition over resources and competencies, often stagnating processes and implementation. At the same time, a difficult transition that has put at risk the FARC’s cohesion has kept its Secretariat addressing immediate crises rather than planning strategically for the future. After having disarmed, the FARC has limited negotiating power, and some observers argue that, after the armed group ceased to exist, the Colombian establishment doesn’t have much interest in really reforming the status quo. In this context, the window of opportunity to establish the foundation for the long-term implementation of the agreement is quickly closing, especially given the possibilities that the new government won’t be supportive of the peace process. The ELN, no doubt, is closely observing the pace of implementation and what they see as the lack of a true commitment on the part of the state to fulfill the promises made in Havana. The peace agreement between the FARC and the Santos administration has the potential to transform Colombia if, and only if, it is implemented. Otherwise, it will remain an aspirational document that will fail millions of Colombians, particularly those in the rural areas, whose lives have been brutally affected by five decades of armed conflict, and who hoped this agreement would bring a better future. Sabrina Stein is the Program Manager of the Conflict Prevention and Peace Forum of the Social Science Research Council.